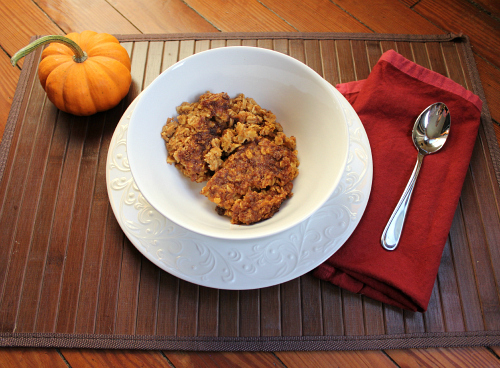 over the weekend we created a new fall breakfast recipe: baked and bruleed pumpkin spice oatmeal. normally, we are not huge fans of oatmeal since it tends to be bland and boring. however, we feel completely different about this oatmeal. this oatmeal has pumpkin, spices, and brown sugar in it, and it is baked instead of cooked on the stove. 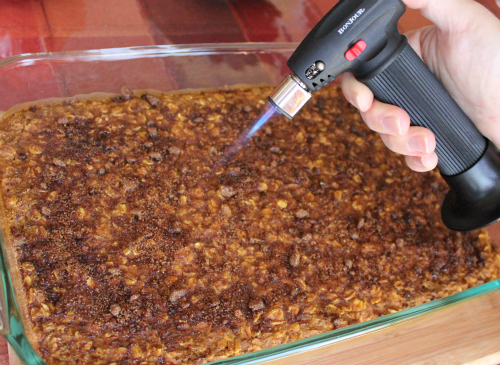 we used our kitchen torch in order to create a bruleed brown sugar topping on this oatmeal that is reminiscent of creme brulee, without being as sweet as its dessert counterpart. we enjoyed our baked and bruleed pumpkin spice oatmeal straight out of the oven while still in our pajamas. you could top off this oatmeal with nuts, milk, maple syrup, or whipped cream, but i'm telling you it's not necessary. it's really perfect just the way it is. if you want a breakfast dish that will wow your family and friends, this is it. this is totally not your grandmother's oatmeal recipe. preheat your oven to 350 degrees F. in a large bowl, whisk together the pumpkin, milk, vanilla, eggs, spices, baking powder, and 1/4 cup of the brown sugar, until all of the ingredients are well combined. stir in the oats, making sure that the oats are evenly distributed throughout the mixture. 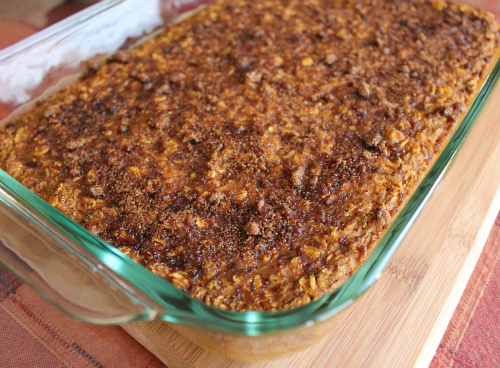 pour the oatmeal mixture into a greased 9x13 inch baking pan, and bake for 25 minutes. remove from the oven, and sprinkle the reserved 1/4 cup of brown sugar evenly over the top of the oatmeal. using a kitchen torch, brulee the brown sugar on top of the oatmeal. (alternately, an oven broiler could be used.) while bruleeing the brown sugar, watch carefully to make sure that the sugar does not burn. serve hot. optional toppings include: nuts, milk, maple syrup, or whipped cream. That sound delicious. We are fans of oatmeal and I will surely try this one on Dad. It is something different rather than the old standby. I also like the apple cinnamon oatmeal recipe that is cooked overnight in the crook pot so it is already for the morning.